Jews have been persecuted throughout the history due to their religious beliefs and foreign culture. In 1897, Jews started a movement called a Zionist movement, to escape persecution and establish their own state in their ancestral homeland, Israel. The World Zionist Organisation was created to advocate for the establishment of a Jewish homeland in Palestine. As a result, a large number of Jews started flowing into Palestine and they bought land and started settling down there. By 1916, Palestine came under the British control after the Sykes-Picot Agreement (a secret agreement between Great Britain and France). This led to the division of the old Ottoman Turkish Empire. Later through Balfour declaration, the British foreign secretary James Balfour agreed to the establishment of a Jewish homeland. After Nazis gained power in Germany in 1930s, the Jews influx to Palestine took a major turn with hundreds of thousands of them resettled from Europe to Palestine. Arabs saw this as a threat to their homeland and they fought bitterly with them. As the British Government remained as a mute spectator, violence reached its peak. In 1947, the British Government referred the question of the future of Palestine to the United Nations. UN voted to split the land into two countries. Jewish people accepted the agreement and declared independence of Israel. Arabs saw the creation of Israel as a part of a conspiracy to move them out of their land. Consequently, in 1948, the Arab states of Egypt, Jordan, Iraq, and Syria declared war on Israel. Note: It’s interesting to note here that India opposed the UN resolution and Gandhi called it as a crime against humanity. But India recognized Israel in 1950. At the end of the war between Israel and Arab countries, Israelemerged victoriously. Moreover, it could increase its territory to a larger extent and it marked the beginning of the expansionist policy of Israel. As a consequence of the war, a large number of Palestinians either flee or were forced to move out of Israel and settle in refugee camps near Israel’s border. It was the beginning of Palestine refugee crisis which ultimately led to the creation of a terrorist organization PLO (Palestine Liberation Organization) in 1964. West Bank and East Jerusalemfrom Jordan. The 1967 war is particularly important for today’s conflict, as it left Israel in control of the West Bank and Gaza Strip, two territories home to a large number of Palestinians. Gaza and Westbank are together known as ‘Occupied Territories’, after 1967 war. Under the UN Charter, there can lawfully be no territorial gains from war, even by a state acting in self-defense. 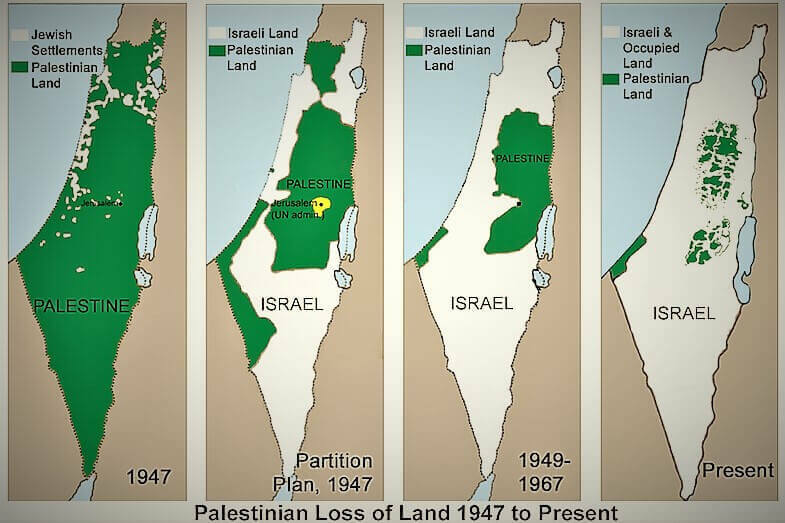 Therefore, in response to the Six-Day War, the UN Security Council adopted a resolution for ‘Land for peace’ and it mandated that Israel should return the captured areas back to the defeated nations. In the light of Israel’s reluctance to return the captured territories, another Arab-Israeli war erupted in 1973 (Yom Kippur war) in which Israel suffered some setbacks. In 1979, Israel-Egypt signed a peace treaty, accordingly Israel return Sinai Peninsula to Egypt (1982).Egypt became the first Arab nation to officially recognize Israel as a state. In 1987, Hamas (Islamic Militant group) for the liberation of Palestine through Jihad came into existence. It refused to recognize Israel as a country. It has received support from Iran and Syria. On the other hand, Fatah, a faction of PLO under Yasser Arafat received support from Western nations. First Intifada: The tension between Israel and Palestine escalated with Israel’s increased settlement in West Bank and Gaza Strip. Palestinians living which in the West Bank and the Gaza Strip fomented the riots begun in 1987, known as the first intifada. Oslo Peace Accord: With the mediation of US and Russia in 1993, Israel and PLO signed Oslo Peace accord which was based on the concept of two state solution. Palestine and Israel signed the Declaration of Principles – in which both nations seek recognition as autonomous governing bodies. PLO recognized Isreal. Isreal agreed to give independence to the ‘occupied territories’. 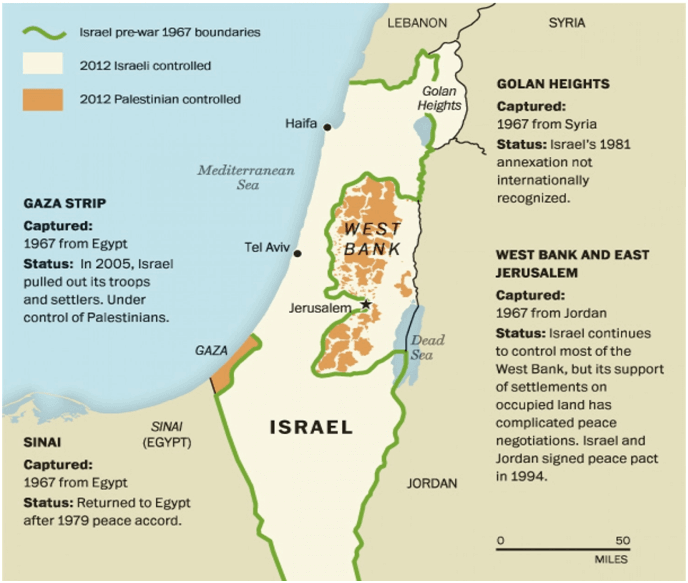 However, territories remained under Israel possession. Camp David Summit (2000): It aimed to help the two sides finally agree on a settlement, but the talks eventually failed. The violence led to the Second Intifada. Second Intifada (2000-05): In 2000, a more violent Palestine Uprising started and a large number of civilians died on both sides. This is known as the second intifada. As a defensive measure, Israel constructed a West Bank Barrieralong West Bank to separate Israel and Palestine settlements. After Oslo accord, a Palestinian Authority (PA) was created with a limited self-rule power in the occupied territories. But this led to disputes between Hamas and Fatah for political power. Hamas – do not accept the Oslo peace accord or 2 state peace resolution. They want the whole state. They control Gaza. Hamas is supported by Iran. Fatah – accept the Oslo peace accord and negotiates for peace. They control West Bank. In 2006, Hamas won Palestine election and it intensified the tensions between Fatah and Hamas for power. After a long armed struggle, in 2011 Palestinian Rivals Fatah and Hamas signed a Reconciliation Pact. Currently, Gaza is controlled by Hamas and Palestine West bank region by Fatah with known presence of Israeli settlements. Operation Protective Edge: By Israel to punish Hamas for abducting and killing Israeli settlers. The US has been playing a significant role as the mediator in the Israel-Palestine. However, its credibility as a mediator had long been questioned by Palestinians. The United States has been criticized by the OIC (Organization of Islamic cooperation) and other Arab organizations, for vetoing most Security Council decisions critical of Israel. Note: The USA has more Jews than Israel. Jews have significance control over US media and economy. Also, Israel receives about $3 billion in direct foreign assistance each year, which is roughly one-fifth of America’s entire foreign aid budget. On the other side, United States has been vocal about its intention to veto any Palestinian bid for statehood. Due to which Palestine had to be satisfied with a ‘non-member observer’ status in UN. However, the second term of Obama administration saw a degrading US-Israel relationship. Iran Nuclear deal of 2015 irritated Israel and it criticized the US for the deal. Obama administration allowed the United Nations to pass a resolution that declared Israel’s growing settlements in the occupied territories illegal. Until that vote, the Obama administration had blocked resolutions criticizing Israel by using its veto power in the UN Security Council. With the new presidency regime under Trump, who is more inclined to Israel, the illegal settlements by the Israel in West Bank and Gaza may see a rise. They want Israeli to withdraw to pre-1967 borders and establish independent Palestine state in West Bank and Gaza. Israel should stop all expansion of settlements before coming to peace talks. 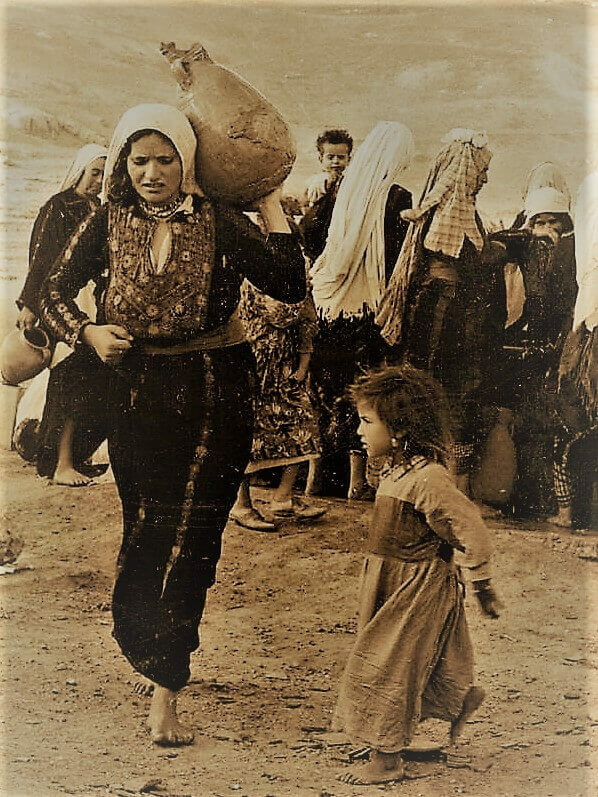 Palestine wants Palestine refugees who lost their homes in 1948 be able to come back. Palestine wants East Jerusalem as the capital of Independent Palestine state. Recognition of Israel as a Jewish State. Note: Israel is the only country in the world created for a religious community. The right of return of Palestine refugees only to Palestine and not to Israel. What is so special with Jerusalem? Jerusalem is a city that straddles the border between Israel and the West Bank. It’s home to some of the holiest sites in both Judaism and Islam, and so both Israel and Palestine want to make it their cap the solution to the Israel-Palestine conflict. The best solution is a “two-state solution” that would establish Palestine as an independent state in Gaza and most of the West Bank, leaving the rest of the land to Israel. Though the two-state plan is clear in theory, the two sides are still deeply divided over how to make it work in practice. One state solution (only Palestine or only Israel) is not a viable option. Road Map for Peace: The European Union, UN, US, and Russia had released a road map in 2003, which outlined a clear timetable towards a Palestinian state. The democratization of the Palestinian society through which a new credible leadership can emerge is necessary. The need of the hour is to treat this conflict as Israeli-Arab conflictrather Israel-Palestine. As we have seen, conflict is not only between Israel and Palestine but also with other Arab countries such as Egypt, Jordan, Iran, Syria etc. All of them should participate in the negotiations and the final agreement should be recognized formally by each one of them along with UN general assembly and security council. It is time for the international community to find a just and lasting peaceful solution to the World’s most intractable conflict soon.